Israeli Prime Minister Benjamin Netanyahu has dismissed police recommendations that he be charged with bribery, fraud and breach of trust, calling the allegations against him “biased, extreme [and] full of holes like Swiss cheese”. The right-wing leader has been subject to two separate parallel police investigations, dubbed cases 1,000 and 2,000, where if he is found guilty, could almost certainly be sent to prison. A previous Israeli Prime Minister, Ehud Olmert, was convicted of breach of trust in 2012 and was sentenced to six years. The first case against Netanyahu relates to gifts, worth nearly $300,000, allegedly given to him and his family by business figures in exchange for political favours. 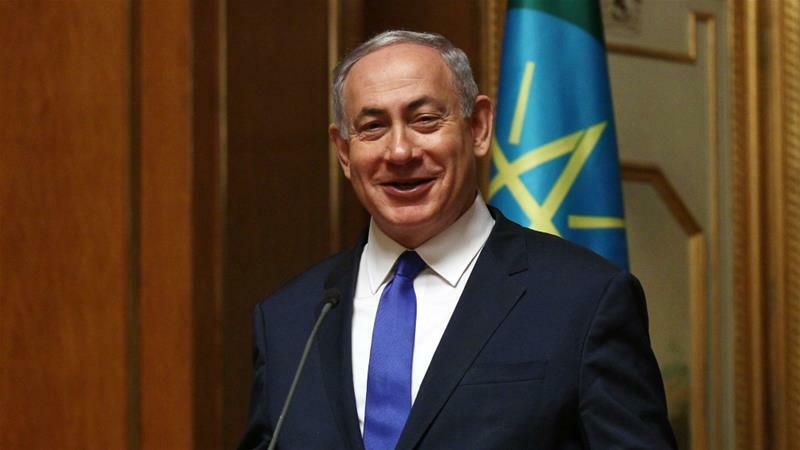 In the second investigation, police allege Netanyahu tried to strike a deal with the country’s largest newspaper Yedioth Ahronoth, that he would support legislation designed to hurt their main competitor, Israel Hayom, in exchange for positive press coverage. Netanyahu has repeatedly rejected the allegations and appeared defiant on Wednesday, saying his government was “stable” despite growing calls for his resignation. “The coalition is stable. No one, not I, not anyone else, has plans to go to an election,” Netanyahu told local government officials in Tel Aviv. “The truth will come to light and nothing will come of this”. Al Jazeera’s Harry Fawcett, reporting from West Jerusalem, said Netanyahu’s political future now rested on how his political allies responded. “Forces within his own Likud party have been strong in lining up behind him, while his opponents, those to the left of him in the Israeli political spectrum, have been unified in their condemnation. “But what will be interesting is what happens with his coalition allies. Netanyahu runs a right-wing coalition and so far, there have been slightly divergent repsonses from its two most senior members. “The finance minister, Moshe Kahlon, has said that its up to the attorney general to make his decision and he won’t be commenting further. But the Education Minister, Naftali Bennett, has said that Netanyahu has “not lived up to the standard” expected of Israeli leaders. He says the Israeli judiciary maintains the presumtion of innocent until proven guilty, but he trusts the police. On Tuesday, Ayman Odeh, the head of the Joint List, a bloc of Palestinian political parties in the Israeli parliament, said that Netanyahu was “corrupt and dangerous”. “Netanyahu must go home,” he wrote on Twitter.